The Toro Power Clear 421Q snow blower is the large version of the Toro Power Clear 221Q snowblower. It uses a slightly bigger engine built by Tecmuseh with a displacement of 0.16 liters. This gives the Toro 421Q a throwing distance of 10.67 m (35 feet) meaning that you can quickly clear large open areas of snow without having to constantly go back over areas that you have already cleared saving a lot of time in the process. The great thing about the 421Q snowblower is that it uses a very clever electric starting mechanism. While there is a pulling, recoil starting system, the electric starting system doesn’t require a large battery and alternator, instead you just need to plug it in and it draws power from the mains. This then starts the Toro’s 4 stroke, gasoline powered Tecmuseh engine using a a 120 V AC starter. There is a slight difference in weight between the recoil and electric starter models. The recoil started Toro Power Clear 421Q weighs in at 38.1 kg (84 lbs) while the electric started 421Q snow blower weighs in at 40.4 kg (89 lbs). So the Toro 421Q snowblower is certainly heavier than smaller models like the Toro 1800 Power Curve Snowblower, but it does have a 0.53 m (21 inches) cutting width which allows it to get rid of up to 816.5 kg (1800 lbs) of snow per minute. Luckily not a whole lot of effort is required to operate the Toro Power Clear 421Q. It’s self propelled thanks to it’s rubber Power Curve auger which grips the ground as it rotates. This means 2 things. Firstly the machine gets rid of snow that is stuck on the ground (and can often become ice). Secondly it means that you can don’t have to push the 421Q snowblower around for hours in the freezing cold. The rubber auger takes care of it for you. 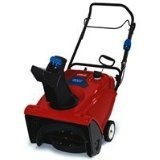 Click Here to but the Toro Power Clear 421Q Snow Blower.